Coming out of the gate fast at CES 2019 is D-Link with announcements that hit some of the biggest topics at the show this year. 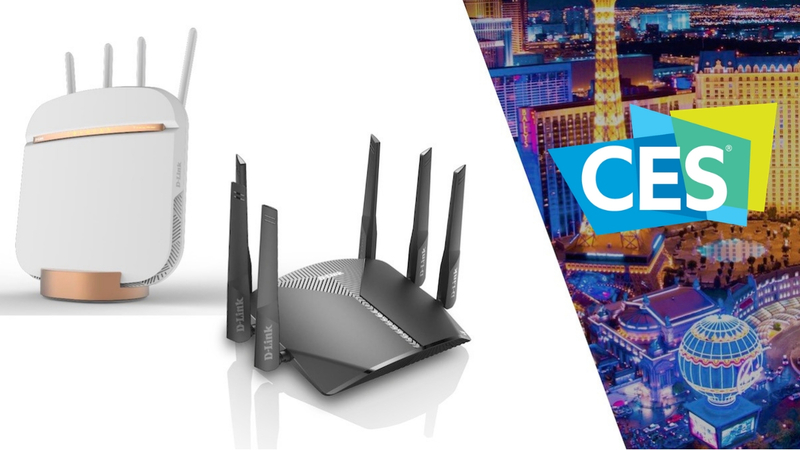 One of the buzzwords that has lead into CES 2019 is 5G and the potential that it will bring to new tech this year – D-Link lead the charge with the brand new 5G NR Enhanced Gateway that is expected to be available to users in the second half of 2019. The DWR-2010 will use a 5G cellular signal to allow download speeds more than 40x faster than current average fixed broadband download speed in the United States. With expanded spectrum and new applications, 5G is going to bring more competition to the broadband market within the coming years. This gateway will help more people access that network in more places with the same wireline experience we have today. — Raman Bridwell, vice president of product and services, D-Link Systems, Inc.
As 5G speeds become available, some consumers may turn to wireless carriers as their home internet provider instead of cable or fiber-optic systems. Hardware like the D-Link 5G gateway will take advantage of the new wireless capability. All Exo devices are expected to be available in Q2 of 2019; both routers and extender points are expected to start at just $79.99. A game-changing addition to the D-Link Exo routers and extender points is the inclusion of security powered by McAfee that starts working as soon as the router is set up and protects every connected device on the network. The security suite will include IoT protection for five years and two years of McAfee antivirus for any laptop, computer, and mobile device – a value of about $700 (far more than the cost of even the top-level Exo router). Hitting the trifecta of CES buzzwords, D-Link has also announced a few new products for the improved mydlink system of smart home products. All the new items require no hub, simply joining an existing Wi-Fi network, and connect to the mydlink application for instructions. Among other products, two new smart plugs are expected in Q2 of 2019 – one designed for indoor use and the other featuring a weatherproof (IP44) design for outdoor use. Entire networks and smart homes can be can be coordinated with voice-control through Google Assistant or Amazon Alexa when combining D-Link’s mesh-enabled Exo system with mydlink IoT devices (especially when the super-fast 5G network is connected).